Featuring the voice talents of Anthony González, Benjamin Bratt, Gael García Bernal, Alanna Ubach, Renee Victor, Jaime Camil, Gabriel Iglesias, Ana Ofelia Murguía, Edward James Olmos, John Ratzenberger, and Cheech Marin. All good things must come to an end, and in recent years, it felt as if Pixar, the once mighty animation behemoth were mid-metamorphosis, awaiting the final turn towards Dreamworks mundanity. 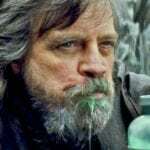 It helps little that be it for Inside Out, their last five features have peaked at Finding Dory, a passing distraction and a sequel unasked for. Thankfully, Coco finds the once mighty studio again reigning supreme; it’s a swaggering, ripe, rich and deeply emotional study of the poetic temperance of passing. Like Inside out, Toy Story 3 and Monsters, Inc. before, it acts as something with which children can come to understand what it is to grow up. Newcomer Anthony Gonzalez stars as Miguel, a child infatuated with music, in particular his here Ernesto de la Cruz (Benjamin Bratt). His family however has outlawed music following the broken heart of his great-great-Grandma, whose musician husband abandoned her. 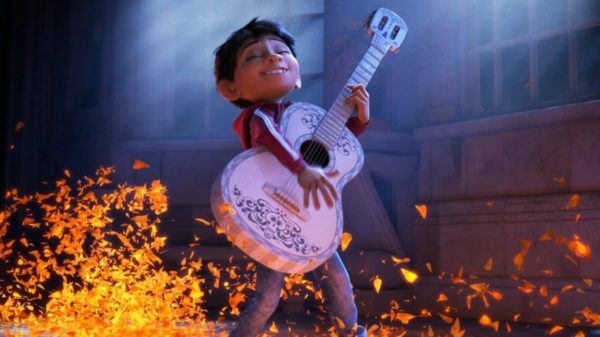 However, when Miguel steals a guitar from the tomb of de la Cruz, he finds himself transported to the Land of the Dead. To get back home, he befriends bumbling skeleton Hector (Gael Garcia Bernal) in order to find a familial member to get back home. It’s a life (death?) lesson dressed in confetti and face paint. There’s a Studio Ghibli vibrancy to the animation and it errs ever towards the psychadelia of early-Disney, at times reminiscent of Dumbo’s dream sequences. Candles glow in such a way, Barry Lyndon-era Kubrick would turn green with envy and there’s almost something distracting about the life-like streets of Mexico. 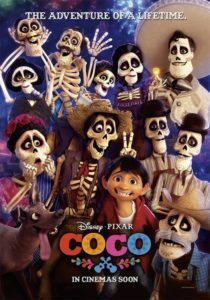 Pixar have long been the forerunners of animated technology and Coco finds them at the absolute pinnacle. Pixar have long created characters that have felt worn in, damaged but entirely real. Miguel’s lust for music and his families dismissal of him is moving and allows the plot to open to those that surround. Each family member adds a wealth of ripe emotion to Miguel’s ultimate quest and his dog sidekick, Dante, too gets to have his moment in the spotlight whilst avoiding the annoyance of Scrat. There’s also “Remember Me,” a ditty that hangs long in the mind and evolves throughout the film, taking on different meanings as and when the film so chooses. It’s a Disney classic in the making. Everything feed back into Pixar’s understanding of what it is to be a child. If Inside Out gave children an understanding of the fact that it’s okay to feel sad, and Toy Story 3 was a study of growing up, Coco is their most mature. It’s a study of loss whilst avoiding the trap of saccharin. But it’s more than that; it allows children to understand that as along as there is someone to remember you by, your legacy will survive. Coco is a triumph.